The difficult process of registering local domains in Zimbabwe is something we have written about extensively here on Techzim. It’s something we feel passionate about for the simple reason that allowing people to easily register local domains easily means more people can try more stuff online easily. Imagine therefore our delight finding out a team of young entrepreneurs had created a solution! It’s now possible people! It’s thanks to two things; Online payments are now possible, using mobile money (EcoCash to be specific). The Pay4App solution, which is still in beta, is being used by more and more people, especially young developers that find other existing methods difficult to access. The second is the team behind new domain registration service; two young people operating a startup by the name of Web Enchanter. The two, Rushmore Mushambi and Isaac Maposa, say it once took them more than two weeks to register a domain and they resolved then to join ZISPA (the organsation that administers the .co.zw space) and help create a solution to this. “To our surprise,” said Mushambi in an interview yesterday, “we found out that ZISPA does indeed live up to its stipulated time of 24 hours. Most of the time they register in less than 12 hours.” What was left was for them to create a solution that would make it as easy as possible for a customer to search for a domain online (something ZISPA already provides), choose an available domain, pay for it conveniently, and they would handle the ZISPA requirements. To register a domain a user just searches for an available name, chooses one they like and then proceeds to pay with EcoCash. Once paid, Web Enchanter processes the domain by electronically submitting it to ZISPA. To the customer the domain shows as pending until ZISPA registers it, which according to Mushambi, usually takes a few hours. A domain we registered via the service took 5 hours. We asked Mushambi how they were handling ZISPA physical documentation that’s required and his response was that they are fulfilling all requirements. “Those [documents] that are required upfront we fill in automatically on behalf of our client, acting as their agents. This allows us to create PDF versions on the fly and submit to ZISPA together with the template. As for ID and utility bill, we plan on making available a form where our clients will be able to upload scanned versions for us to keep. Since these are not needed right away, they can do that at their convenience.” he explained. But even without these, since payments are being made online using EcoCash, the Know Your Customer ZISPA (and POTRAZ) requirements can still be easily met by using the mobile money platform. The registrations cost $9.99 per year. Is the site broken or its just me? can seem to get past “check availability”. Otherwise a very welcome move. tired or having dot com even for sites where co.zw is more appropriate. What’s happening when you click on “check availability” button? You can respond here or email me on https://webenchanter.com/zwe/domains/contact so I can take a look. But i don’t know where people get this MYTH that co.zw are difficult to register. The longest it has ever taken me to register a domain was 48hrs and that’s because it was a weekend. i have been able to register for a .com domain without any need for utility bill/id. i think that is part of the reason why it is considered difficult. and i have seen on the ZISPA website that they require u to have a registered company in order to register a domain. For years the onus was simply on ISP to verify docs and email the template or submit in person (anyone remember Tari or Katherine). in my opinion, i dont think this system is as automated as they make it out to be. but good idea anyway. registering a domain and paying for it is automated. in the background they still do the manual stuff that ZISPA requires. Documentation that’s required by ZISPA is also compiled and submitted automatically. It’s the IDs and utility bills we will inspect and approve manually, but that will be done even after the domain has been registered; at the client’s convenience. At the moment we haven’t even implemented that part yet. To verify your domain on Google Apps, you need to add the DNS records provided by Google Apps to your domain’s DNS records within your control panel. If it’s on Name.co.zw you log in to your Name.co.zw account and click on the DNS button in front of your domain. This will automatically log you into the control panel where you can add the DNS records you have been provided by Google to verify domain ownership. On our end everything is indeed automated. From the moment you sign up to submitting your application to ZISPA. The only waiting period your application will have is when waiting for ZISPA to process the application. We have no control over that. dude, didnt u study at Allan Wilson High? I did ( http://webenchanter.com/about ). Yes. Every app you put on the internet needs to have security measures in place. It’s part of the trade, otherwise there would be no Google, no Facebook, we wouldn’t even be able to register .coms and other international top level domains… hell we wouldn’t even be able to make comments here on TechZim! As for false information much has been said here on TechZim on how difficult (or impossible?) it is to get this right. Even all these things can be forged. No system is perfect. I have registered a number of .co.zw domains before, both for personal and for our clients through at least 2 other ISPs and I can tell you for certain that I have NEVER been asked to provide these. Also if you read Charles’ comment, he was able to register his over the phone! Having said that, at Web Enchanter, we aim for total compliance. For starters right now people can only pay via Ecocash. This means that, if need be, your details can be traced via Econet. We are also looking at integrating with vPayments and Visa/MasterCard. For vPayments you will need to have a bank account in Zimbabwe. For Visa/MasterCard I think we will send a confirmation code to a Zimbabwean mobile number before a person can even pay for their domain(s). If they can’t pay then they can’t even register. If you, as I suspect you might, think that these are not enough, that is why we are working on asking people to scan and upload the required documentation in their control panel. We will then verify the submitted documentation manually, approve and then store it for reference. Say for some reason a dispute arises and you fail to provide the needed documentation then the domain can always be deleted and made available for someone else to register. Also note that even after we have implemented the above steps, registration will still be automatic as these things are not stored by ZISPA but us. We want your experience to be as convenient and as hassle free as possible. I’m NOT a lawyer, and as such the following advice should not be treated as legal advice but personal opinion. For a legal interpretation of the above clauses I suggest you consult your lawyer. With the above disclaimer in mind, I think there really is no point in falsifying information. It’s merely a choice for ZISPA to determine whether you have a right to register a domain or not. The only sure-fire way to protect your brand (or name) is to register it first before anyone else does. Don’t expect ZISPA to protect you from this! B*llshit, what about how they wrestled google.co.zw from the guy who had had the foresight to register it first? ok, thats great. but i do know that end users need to sign a zispa terms and agreement form when submitting the registration of a domain. how is it that you are handling this? or perhaps zispa are now going ahead and accepting registrations without these documents? Thanks Sam. We wouldn’t have managed to automate the whole process using EcoCash if it wasn’t for Pay4App, so a big thanks to you as well. Can someone use their own nameservers? Yes they can. On the application form you can put in your own nameservers and IP addresses. We are no longer asking for IP addresses as some clients were putting in wrong ones, which delays registration as ZISPA won’t continue processing the application. You just put in your nameservers and we lookup the IPs automatically. Thanks for posting this Mr. Kabweza. We really appreciate all the publicity we can get. Your support means a lot. Everything seems fine this end. One client just completed registering their domain 10 minutes ago. Which link? Please post the URL here or email me ( https://webenchanter.com/zwe/domains/contact ) and I will check it for you. OK, thanks. I have looked into the issue and responded accordingly. In case someone else runs into this problem soon… Once you get to the “submit application” page and hit “apply”, your order will be recorded in the system and your domain captured. If for some reason you run into a problem in the subsequent steps and need to go back to the payment page, simply log out then log back in. You will automatically be taken to the payment page. From there you can then click on the “Pay with Ecocash by Pay4App” button which will then take you to Pay4App to settle your order. By tomorrow I will have fixed this. In the meantime please bear with us and avoid re-submitting that form. Well done guys. Registered mine for email purposes only via ZOL way back (2004 I think) but was forced to get a whole bunch of packages/services I did not want. Thanks. Yes, that’s one of the hassles we try to solve. Clever idea. Please also setup international payments eg paypal. Or some visa thing titengewo like buying a song on itunes. This company called N-Sho Technologies has been doing it for years! I once went on their website and entered the .co.zw domain I want, saw it was available, then I clicked on buy or something and it sent the request to them and they called and I registered the domain over the phone. How is this a big improvement? Obviously I can’t speak conclusively on this as I am not familiar with their service, but from what you are saying it sounds like they were receiving the applications then processing them manually on your behalf. Most ISPs do this also. Some will point you to a contact form and some have a form specific one for domain registrations but that’s it. From there they will process your application manually. Probably the difference between them and N-Sho is that the later offers (or offered?) a much better/faster service. With us on the other hand, everything is automated. It’s you interacting with a computer to prepare your application, make your payment and then the computer submits your application for you instantly. We virtually give you a direct channel to ZISPA. The difference between the service you get from this computer versus the service you get from support staff seem negligible at first but it’s huge. Think about it… The computer is always there for you 24/7, it will always render the same level of service to you everytime, it will never make any typos on your application etc. A small typo in your domain name can mean the process will take at least double the time it takes to register as it will need to be submitted again. Of course you can even make the typo yourself but the risk is halved as there is no one else who can make it but you. A typo in a domain name means you pay twice… Thats why i copy and paste from a clients’ email. You pay twice to who? Domains arent renamed, they are recreated and the old one deleted. If the error is on your part I imagine, indeed an ISP would charge you twice. We had an ISP mistype once, it was deleted and re-registered at no additional charge. Thanks for your response but their system automatically checks for a domain I typed if its available, that same name THAT I TYPED will be forwarded to them and set to pending/reserved until I make a payment which can be with ecocash or whatever I choose. They respond within 12 hours of receiving the request, usually a few minutes they say, it was a few minutes for me though if I remember correctly. I like the service been offered but what boggles my mind is why haven’t any of isp ever thought of doing this. Let alone zispa are they really that stupid. Yes they all are. Yes ISPs are to blame here but not ZISPA. That’s not its role. ZISPA is doing a fantastic job as far as registering domains are concerned. I’m not too thrilled about how they are managing their website though. It was last updated ages ago. In cyber time it may as well be centuries ago. Heading misleading they still do it manually.In fact its faster to print the form online from ZISPA site and take it to ZOL thn this giberish.First what ? Of Zimbos and celebrating crap. Fact: Zimbabwe needs less people like you. Hey its only normal to find critics and anti-developmental people. These people that you want to ridicule are obviously working on improving the whole system and will eventually get to full automation. Why do you not even blame ZISPA for requiring hard copy documents in this day and age rather than blame someone trying to bridge that gap. I wish you publish what you are working on that has added value to the Kitsi-yatota and the Kapoto-kasina-ridhi of your society!! Not necessarily true. We email ZISPA too as soon as your order is finalised. It just depends on whether ZISPA is processing applications at that particular time. Just yesterday we had a client whose domain was registered just seconds after completing their Ecocash payment. ZISPA charges $35 per domain and send their invoice to that effect. Are you even giving them a cent for their services? Last I checked, and I admit it’s been a while, they actually charge their members a flat $30 a month for everything. True. That’s still the case. Been a member for a few years, but they invoice domain separately and individually as a digest end of month? That setup was for like around 2009/10 to charge a flat monthly fee. Is it still in effect? with Ecocash service being down, what is the alternative payment option? Is their a way, in case i missed it, to do bundle selection of domains one needs to pay for as I need a couple (before they get snapped up) ? Anyway, for now the only option is Ecocash as we currently bank with Standard Chartered Bank (not on vPayments). We are working on opening another bank account so we can integrate with vPayments. I recommend opening an account with Pay4App and linking your Ecocash number with them. You can then proceed to checkout even if Ecocash is down. This means that when Ecocash comes back online, you won’t need to go online. You can then just transfer the money to Pay4App and have your order processed right away. As for registering multiple domains you can put in as many domains as you want separated by commas. The system will then check the ones available. You will then be able to pick the ones you want. We are also working on a shopping cart so you can pick or dop a domain at any point before checking out. eventually went through, paid, accepted, reversed et al. Thanks for your business. I wish you the best in your appeal. Even in the current setup a domainer can still park domains with enough incentive. You don’t park a domain for free even with this new service. 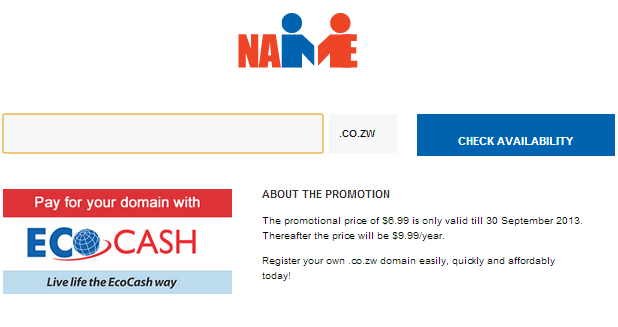 Signed up with name.co.zw for a domain & within 5hrs of payment all was live! So far excellent service, well done. Thanks Alan! We really appreciate your support. However, the actual price will be set depending on the address of the owner of the domain. Asking questions are genuinely good thing if you are not understanding something entirely, but this paragraph offers good understanding even. Absolutely love your service. Paid via ECOCASH, got my receipt at 11:18AM and confirmation of domain registration came in 12:40AM. Thanks for the Christmas Promo!